This book is not an intellectual history or popular summary of recent work on consciousness in humans. Bernard Baars (1988), Edelman and Tononi (2000), and many others, have written such, and done it well indeed. 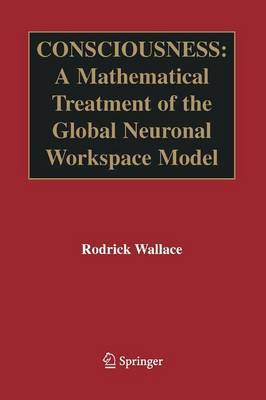 This book, rather, brings the powerful analytic machinery of communication theory to bear on the Global Neuronal Workspace (GNW) model of consciousness which Baars introduced, and does so in a formal mathematical manner. It is not the first such attempt. The philospher Fred Dretske (1981), indep- dent of Baars, long ago outlined how information theory might illuminate the understanding of mind. Adapting his approach on the necessary conditions for mental process, we apply a previously-developed information theory analysis of interacting cognitive biological and social modules to Baars' GNW, which has become the principal candidate for a 'standard model' of consciousness. Invoking an obvious canonical homology with statistical physics, the method, when iterated in the spirit of the Hierarchical Linear Model of regression theory, generates a fluctuating dynamic threshold for consciousness which is similar to a tunable phase transition in a physical system. The phenomenon is, however, constrained to a manifold/atlas structure analogous to a retina; an adaptable Rate Distortion manifold, whose 'topology', in a large sense, reflects the hierarchy of embedding constraints acting on consciousness. This view greatly extends what Baars has characterized as 'contexts.